Rescuers battling to free more than 30 people from a collapsed Indonesian gold mine have brought in a heavy excavator, amid fears time is running out. Emergency teams had previously used only spades and their bare hands amid fears of triggering another landslide. Indonesia's disaster agency said on Thursday that 19 people had been rescued from the illegal site in Bolaang Mongondow, on Sulawesi island. Eight are confirmed dead, with 36 still feared trapped. Teams have been trying to get food and water to those underground, but there are concerns that their oxygen supply is waning. A handful of victims have called for help from within the mine shafts, but disaster official Abdul Muin Paputungan said they could no longer hear voices. Authorities said dozens of people were underground when support beams gave way at the mine on Tuesday, due to shifting soil land and numerous mining shafts. The collapse then triggered a landslide. The terrain around the mine is steep and muddy, and rescue teams have reportedly carried survivors off the hillside on makeshift stretchers made from branches and twine. 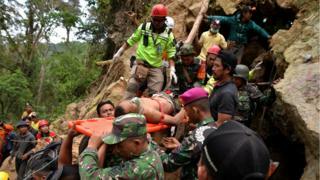 One miner died after his leg was amputated in efforts to free him, local disaster official Abdul Muin Paputungan said. How do you clear tonnes of toxic sludge? 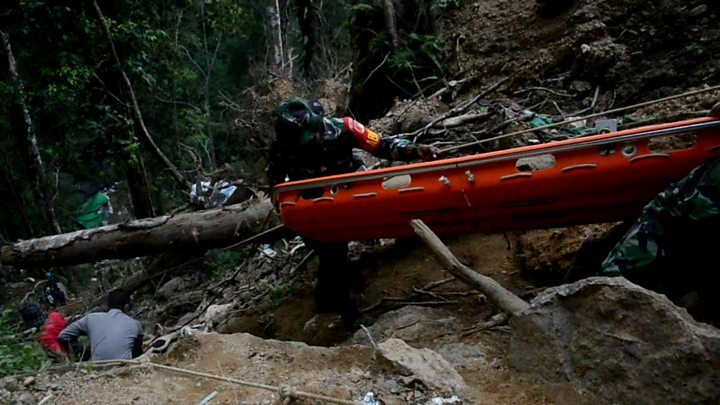 "Rescuers were forced to amputate the victim's leg because it was stuck under a rock, and they were afraid that moving the rock would cause a further collapse," disaster agency spokesman Sutopo Purwo Nugroho said in a statement. The search for survivors is expected to continue until at least Tuesday. More than 200 rescuers and military personnel have joined the operation, Reuters reports. Small-scale gold mining is banned in Indonesia but remains widespread in rural areas. Lack of regulation and the poor construction of makeshift mines means accidents are relatively frequent. Campaigners have long argued that a lack of local employment opportunities means people feel forced to rely on illegal mining.